austrianalpine.com: Alpinverein Salzburg alpine.ausbildung, "Schihochtouren"
We had a great course over ski mountaineering at the end of May. 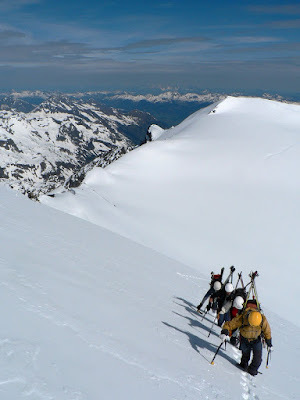 The course was on the north side of the Grossglockner mountain at the Oberwalder Hütte. The weather was better than expected, but somewhat unsettled. 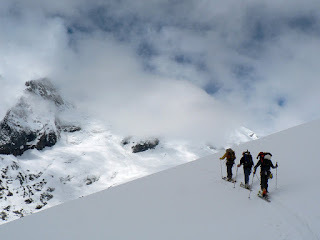 We did have one day of really great weather, which allowed us to do a classic tour and ski perfect corn snow. Course member Christain Perst took a lot of nice photos. Here are a few of them. On the left are some of the group heading to the hut. The Oberwalder hut is on top of the rock outcrop obscured by clouds on the left side of the picture. The hut is at just under 3000 meters. Below shows a fast way to build an equalized snow anchor with skis. 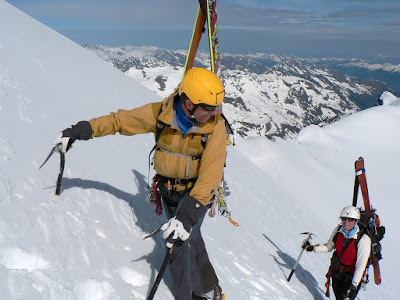 In the right snow conditions this type of anchor is great for crevasse rescue and belaying steep snow slopes. The skis are rammed into the snow slightly against the direction of pull and off-set. I am using a 240cm sling with a twist to create a sliding point of equalization. When we are travelling high in the mountains on glacier covered terrain, we have two great snow anchors already on our feet. One of my favorite things to do in the ski mountaineering season is to combine steep snow and ice faces with ski descents. 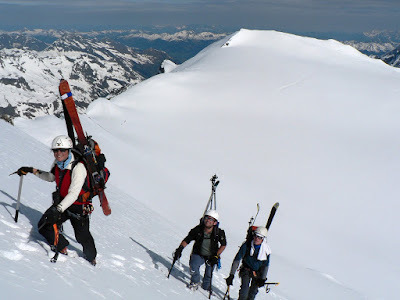 For the course we used our "best weather day" to climb the north east face (45 degrees / 250 meters) and ski down the north facing shoulder of the Johannisberg. 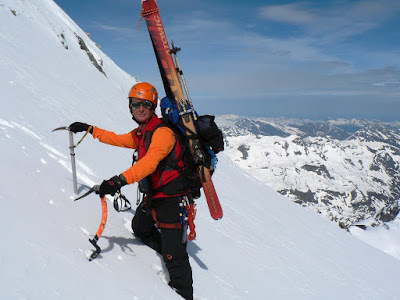 The route is a great introduction for newbies into this type of ski alpinism. The next few photos give you a good feel of the face. What Makes A Good Course?